This is a Dell Dimension XPS 4100 case. 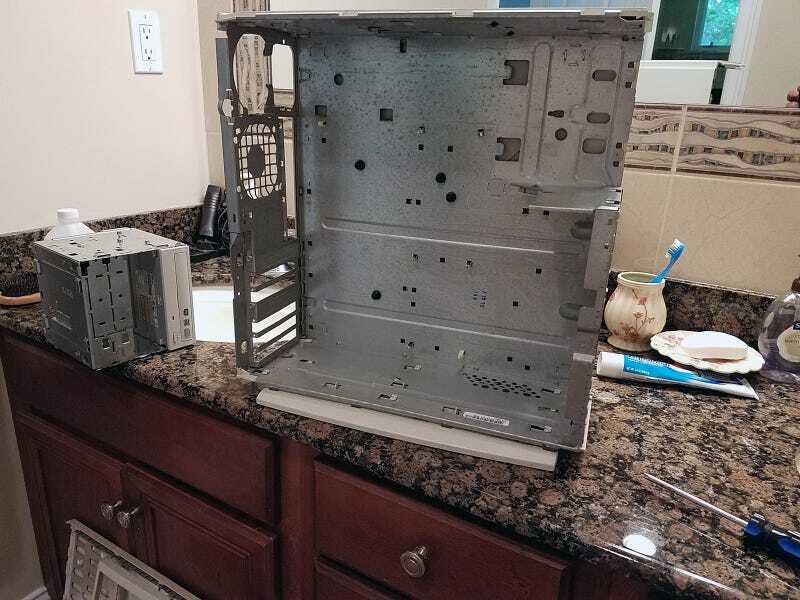 I gutted it and put its Pentium III parts into another case. The first order was to clean everything. Air compressor got rid of most of the dust and everything else was wiped down. Even the edges had grime on them removed via q-tips. Dell and Micron used Palo Alto ATCX cases for several years in the late 1990s. They are roomy, albeit narrow, but can take ATX motherboards. There were a couple issues here... I couldn’t use the motherboard’s I/O shield and I had to snip a piece of metal from the rear so it wouldn’t interfere with my power supply’s on/off switch. The front panel header had a pin blocked so it wouldn’t fit originally. Removed the pin filling with a needle and it works fine. Messy cables... I tried to tuck some behind others and into crevices to keep them away from the fan and cooler. The front panel connector is just long enough to reach. I still had to modify the plastic part that holds it in place. The front, complete with a Skylake sticker. I chose to use the older style front bezel and I found one for $8 shipped on eBay. Original service tag + Windows 98SE product key included. It’s ALIVE! It also runs really quiet, which was a bit surprising. It was fun! Always wanted to do something like this. dat sleeper build. Deyellowed the drive bay panels. Not perfect but a definite improvement.